Mother Teresa’s notable interview with Thom O’Connor is now available for viewing on YouTube. 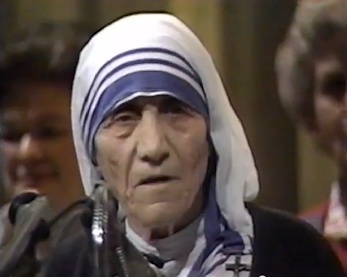 In this interview, Mother Teresa affirms the dignity of life, explaining that this dignity comes from the fact that every person is made in the image of God. The video then segues into an interview that Mother Teresa granted to news reporter Russell Barber. Despite its poor quality, the interviews in the video are real gems and worth passing on to the next generation of pro-life advocates. Abortion has become the greatest destroyer of peace today because it destroys the life of the child, but it destroys the conscience of the mother of course, and for years and years she knows that she has murdered her own child. The poor people are not destroying the unborn child. It is better-off people who want something else, and they are afraid of the little one so they destroy the child. But the very poor people are not doing that. We see that again and again in all the different places wherever our sisters are working. An unborn child is something very special because it has the presence of God and the gift of God. I don’t know how the mother can murder her own child. Something unbelievable. Abortion is not solving the difficulty of population. Abortion is creating evil because if mother can kill her own child, what’s left for other people to kill each other? Killing life, killing the image of God, can never be… it’s an evil. That’s why abortion has become the greatest destroyer of peace today. All works of love are works of peace. I will pray for you, that you will make your family life something holy, something like Nazareth, with love, peace, and joy. And from there, you can spread that love. Especially father and mother. Be one heart full of love in the heart of Jesus through Mary. Keep the joy of loving each other and share this joy with all you meet, who will look up and see how you love each other.